The crumbling “liberal” West is in a desperate hurry in the Balkans. More than a quarter century since the first Western states, pushed by Germany, unilaterally recognized the secession of the former Yugoslav federal republics of Slovenia, Croatia and Bosnia-Herzegovina and about 19 years since NATO’s air and land attack against what had remained of the country (the Federal Republic of Yugoslavia, comprising Serbia and Montenegro) resulting in NATO’s occupation and subsequent forced amputation of Serbia’s Kosovo and Metohija province (by way of recognition of its unilaterally declared independence of February 2008 by the main Western powers, some – but not all Muslim countries – and all the smaller countries whose hands Uncle Sam could either twist or stuff with a fistful of dollars) – NATO’s taskmasters are increasingly showing signs of nervousness for having failed to establish complete control over the territory of the former model multi-ethnic country and calls for the Alliance to take care of “unfinished business” in the region are gaining in volume. Just last summer, Montenegro was expressly absorbed into NATO, on the wings of a contrived, supposedly Russian-backed “attempted coup” (the “evidence” of which is on par with that so far offered to back claims of the Trump campaign’s alleged collusion with Russians during the 2016 US presidential campaign) and the associated intimidation and scare-mongering used to justify pushing the country into the Alliance without allowing something as cumbersome as a referendum to get in the way. This special op might have, at first glance, seemed rather trivial, considering Montenegro’s tiny size and population of about 600,000. Until, that is, one looks at a map and realizes that the traditionally Russian-allied country was the last non-NATO holdout in the northern Mediterranean. Next, it was Macedonia’s turn. First, its nationalist government, which had the temerity to actively court Chinese investment and good relations with Russia had to be jettisoned. This was accomplished through a destabilizing George Soros and US-backed campaign, the inevitable evidence-free claims of “Russian meddling” and the installing of a new pro-Western government in May 2017, brokered by the EU and US, after some major arm-twisting by US diplomat Hoyt Brian Yee (the deputy of Victoria Nuland of the Ukrainian coup and “F*ck the EU” fame), with the crucial aid of Macedonia’s Albanian minority – the Atlanticists’ most reliable trump card in the Balkans over the past three decades. In addition to promising the Albanians equal status with that of the majority Macedonians (who are South Slavs and make up about 65% of the population, as opposed to the Albanians’ 25%), new prime minister Zoran Zaev’s main task is to make way for Macedonia’s EU accession and express admission to – you guessed it – NATO. Toward that end, hurried negotiations are now being conducted with Greece, which has been blocking Macedonia’s NATO aspirations for the better part of two decades until the country changes its name, i.e., gives up claims to being the historic Macedonia of Alexander the Great and, potentially, to Greece’s own Macedonia region. Since the start of 2018, Macedonia’s new government has taken steps toward that end, renaming its capital city Skopje’s airport (from “Alexander the Great” to “Skopje International Airport”) as well as its main highway to Greece (from “Alexander the Great” to “Friendship Highway”). That still hasn’t fully satisfied Greece, but Macedonian diplomacy is doing its utmost to speed the process along in time for the next NATO summit in July 2018. By securing Macedonia, NATO not only adds another piece of jewelry but also gains firm control of a key communication along the Balkan branch of both China’s New Silk Road and the Russian Turkish Stream gas pipeline. That leaves Serbia and Bosnia-Herzegovina (B-H) as the last former Yugoslav non-NATO holdouts. Serbia is still a hard nut to crack, due to its relative size, traditional stubborn independence and military tradition – although it is being subjected to increasing pressure, as witnessed by Russian Foreign Minister Lavrov’s recent warning that the West was pushing Serbia towards a Ukrainian scenario by forcing it to choose between the EU and Russia. That leaves B-H as the weakest remaining link to break. The political parties representing the majority Muslims are not an obstacle, nor are the Croats (roughly 17% of the population). However, Bosnia’s Serbs, making up about a third of the population, but controlling 49% of the territory as a result of the Dayton Peace Accords of 1995 (according to which B-H is made up of two entities: the Serbian majority Republika Srpska, and the Muslim and Croat majority B-H Federation, comprising 51% of the country), are resolutely opposed to NATO membership, for three main reasons: a) memories of NATO powers’ demonization of the Serbs and siding with Sarajevo’s Islamic fundamentalist leadership during the bloody civil war of 1992-95, as well as today, b) refusal to be at odds with neighboring Serbia, which has declared military neutrality and refusal to join any military bloc, c) desire to retain friendship with Russia and other non-NATO countries. As a result, since adopting its own Resolution on military neutrality last fall, making it impossible for B-H to be officially invited to join NATO, the Serbian leadership in B-H has been subjected to various fake news campaigns and provocations concocted in various Anglo-American media, military and diplomatic kitchens. First came allegations that – what else? – a “Russian-trained” group under the name “Serbian Honor” (or “Srbska čast” in the original Serbian) took part in a parade marking the anniversary of Republika Srpska on January 9. The Washington Post and the Guardian quickly put out the distress calls, with appropriately alarmist headlines: “Russia finds young men who love guns — and grooms them” and “Russian-trained mercenaries back Bosnia’s Serb separatists.” But, as has become the custom of late with what Donald Trump has christened the fake news media, the claims have proven to be evidence-free. For one, while a group called “Serbian Honor” does exist, Republika Srpska Police Minister Dragan Lukac has denied that it took part in the parade. For two, absolutely no evidence has been offered that its members are “Russian-trained,” except for empty claims of supposed ties between this obscure group and the Russian-Serbian Humanitarian Center established in the Serbian city of Nish in 2012. The irony here is especially rich, as the Center’s main activity since its inception has been to provide personnel and resources to help clear the thousands of illegal cluster munitions and aerial bombs left behind by NATO’s illegal bombing of Serbia in 1999. That’s right: Russian resources are being used to clean up NATO’s crime scene. And, yet, the lead NATO country is accusing Russia of exercising “malign influence” in the region. The Center also provided vital aid during the catastrophic floods that beset Serbia in 2014. Yet, again, the main NATO countries have persistently tried to portray this small outpost – hosting, as Serbia’s foreign minister has put it, a grand total of “five Serbs, four Russians and one dog” – as some sort of sinister spy, or even military base. All that has been lacking is – you guessed it – evidence to back up these ludicrous claims. Even Reuters admitted as much, reporting that no sources were cited in the original story to back up the claim that “mercenaries” were being trained there. But, as we’ve learned, especially over the past several years, a minor inconvenience such as the truth must not stand in the way of the “greater good” of restarting the Cold War, even at the risk of making it substantially “warmer” than its previous incarnation. Then, in early February, came another (alleged) scandal: the dastardly Bosnian Serb police were now – egads! – arming themselves. “Arms shipment to Bosnian Serbs stokes EU fears,” warned the trusty Guardian, with accompanying echoes in the Bosnian Muslim press. Except, it turned out that the Republika Srpska police had finally decided to buy its first batch of guns in 20 years. And that it had all been cleared with the B-H central authorities. And that, as clarified by the well respected Croatian journalist, Darko Hudelist, other police units in Bosnia’s Muslim-majority cantons had also recently purchased new weapons. Of course, there was no accompanying screaming Guardian headline to set the record straight. Finally, in mid February, a Bosnian news site uncovered plans to hold a NATO military exercise in B-H in 2019. Naturally, this was to take part in the resolutely anti-NATO Serbian majority part of the country, near its capital of Banja Luka. However, the real news was the planned use of American A-10 Warthog close air support warplanes, and their possible use of depleted uranium munitions. As was to be expected, the response from Republika Srpska was that of outrage. 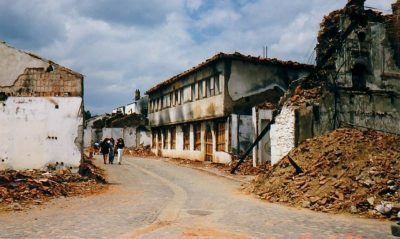 NATO had twice bombed Serbian army positions during the B-H civil war, in 1994 and 1995, and the population living in the areas where DU ammunition was used saw an alarming rise in cancer rates in the subsequent years, as has been the case in neighboring Serbia, where DU munitions were much more heavily used during NATO’s illegal air war of 1999. The US Embassy in Sarajevo issued denials, but the published documents did indeed show that the use of A-10 and DU ammunition was being considered. Milorad Dodik, the president of Republika Srpska, flatly warned NATO “not to dare” use DU ammo, while the inhabitants of the villages near the proposed military exercise site vowed to block the event from taking place. This is classic psychological warfare, and it’s bound to intensify. For, in its steady buildup along Russia’s western borders, NATO seems to be seeking to eliminate all potential loose ends in its rear. And Serbia and Bosnia-Herzegovina are precisely that. In the war-weary Balkans, especially in the Serbian majority parts, that kind of calculus has an eerily familiar ring. It was the Serbs that rose to reject the Royal Yugoslav government’s attempt to appease Nazi Germany by signing a pact with it on March 25, 1941. As a result, Hitler had to postpone his attack on the USSR for several crucial weeks until the Serbian-led rebellion could be pacified (it was, but only briefly, as two majority Serb guerilla movements arose during summer of 1941, and fought on until the country’s liberation). Some think that this at least partly contributed to the Nazi war machine’s failure to break Stalin before the Russian winter set in, which ultimately cost it the war. Some might find the analogy surprising. But actions speak louder than words. As in the US, it’s now practically all “Russia! Russia! Russia!” in the Balkans, and the traditionally pro-Russian Serbs are under rapidly increasing political, propaganda and military pressure to join the “new order,” finally give up their historic and spiritual Kosovo heartland, and turn their backs on their traditional Russian ally and Orthodox Christian co-religionists. The West’s quarter century long anti-Serbian and, by extension, anti-Russian crusade is intensifying, and things may well be coming to a head in the near future.